Now that CEOs will be held personally accountable for statements they make about their organizations, we can all expect to be held to higher standards of professional ethics. Some professions have formal codes of ethics, but most don't. What ethical principles guide you? With the non-controversial topics out of the way, they moved on to what they all knew was the most difficult issue. Everyone felt the tension, though perhaps no one felt the pressure Trish did. She knew that whatever they announced publicly would affect the share price, and the critical factor would be her estimate of the delay on Metronome. Everyone in the room would feel the pain. "On to Metronome," Jack pronounced. "Trish?" 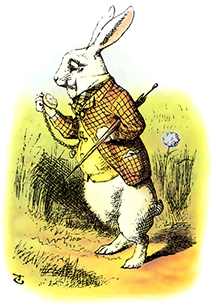 The rabbit that went — late — down the rabbit-hole. A colorized illustration from Alice's Adventures in Wonderland , by Lewis Carroll, from the original illustration by John Tenniel. Online editions of Alice are available at various Web sites, but this illustration is from the edition at www.gasl.org. Here we go, she thought. The dates were bad news, but the estimates were Peter's, and Peter was the best. The dates were right. "As you all know, the news isn't good. The estimates are June 30th, best case, but possibly as late as November." Silence. Warfield, as usual, spoke first. "That's unacceptable. What are your plans for replacing Peter?" "I have no plans for replacing Peter, or anyone else," Trish replied. "They've all done a marvelous job with what we gave them, and it's up to us now to manage this." In some organizations, Trish's recommendation is unusual. Rather than blaming someone for an organizational failure, Trish believes that the company must tell the public the hard truth. What would you have done? Now that CEO's will be personally accountable for statements they make about their organizations, we can all expect to be held to higher standards of professional ethics. Some professions have codes of ethics, but most of us don't even have professional associations we could join, let alone formal codes of ethics to guide us. When you doubt the propriety of an action or decision, what principles guide you? Whether or not you can turn to an association for ethical guidance, writing down a code of ethics for your job can help. Try it. Here are some principles to get you started. If you would personally benefit from an action you're about to take, it could be questionable. Examine such actions carefully. The appearance of unethical behavior is as damaging as actual unethical behavior. Avoid even the appearance of crossing the line. Unethical behavior need not be proactive. In some situations, doing nothing can be unethical. If you intentionally use a key phrase, explain its significance to the listener. Relying on listeners to grasp the importance of innocent-sounding words could be a way of misleading people. Legal standards are usually less restrictive than ethical standards. Excessive concern with the legalities of your actions might mean that you're in danger of ethical transgression. See "On the Appearance of Impropriety," Point Lookout for December 2, 2009 for a bit more on the appearance of impropriety. Would you like to see your comments posted here? rbrenzmgmSJtKoaiZMQdNner@ChacZvxcbGvDkqYfZYECoCanyon.comSend me your comments by email, or by Web form. Most of us have information that's "company confidential," or even more sensitive than that. Sometimes people who want to know what we know try to suspend our ability to think critically. Here are some of their techniques. I offer email and telephone coaching at both corporate and individual rates. Contact Rick for details at rbrenDUbkXbZuHHhjGTdpner@ChacOCQfcuikbXyFkoeLoCanyon.com or (650) 787-6475, or toll-free in the continental US at (866) 378-5470.